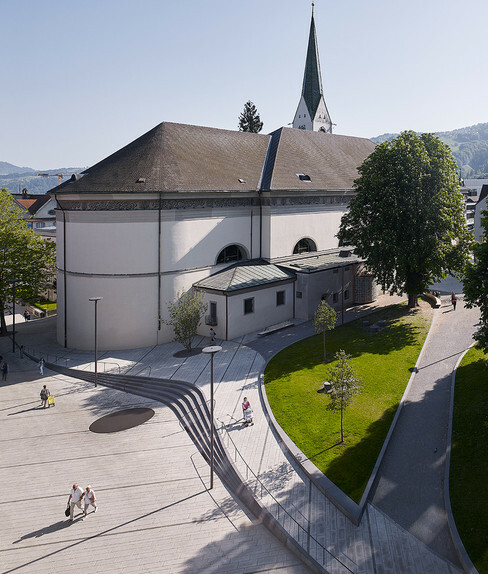 Much of the centre of Dornbirn has been a traffic-free pedestrian zone and a lively location for events since 1989. 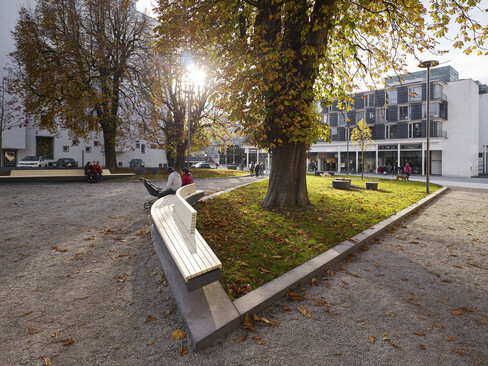 According to the urban development plan the edge of Dornbirn’s old town, with its small-scale, rural structure, should undergo a long-term transformation into a busy and dynamic downtown district. The centrally situated market square is dominated on its western edge by the Parish Church. The pedestrian zone stretches in an arc around the church from the square towards Schulgasse to the west. Due to its significance as an important main axis across the town centre Schulgasse acts as a spatial connection between a series of socially and culturally significant locations. The expansion of the pedestrian zone towards Schulgasse will enable the core of the town to fulfil its new role as a dynamic centre. A change in the level of Schulgasse divides the district topographically and territorially. The resulting zoning makes it possible to create a range of atmospheres and focal points. The project reacts both spatially and architecturally to this urban reality, concentrating it into a physical “urban joint”. The joint enables the market square to stretch along Schulgasse in a flexible, linear fashion. The green space of Kirchpark is designed as a raised landscape. 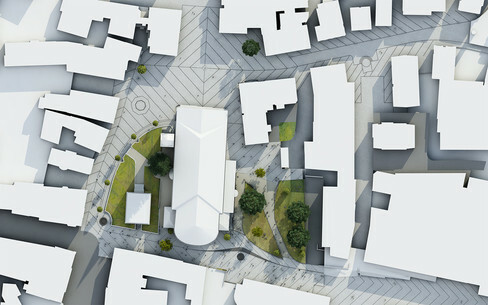 It offers an overview of the park and differentiates the square in terms of both programme and circulation. The diagonal axis and the existing secondary paths around the edges are retained. The continuation of the surface finish of the market square into Kirchpark creates a space for small events. The bank sloping down towards the church invites visitors to take a break under the shadow of the trees. These include plane trees, red and turkey oaks, pagoda trees, silver limes and a flowering cherry. Small spatial interventions create a series of spatially differentiated locations. Places that highlight the different parts of Schulgasse by creating a range of atmospheres. Bahnhofstraße, for example, feels like a threshold to the old town, a place free of the pressure to consume where one can relax and observe the busy comings-and-goings of the entrance to the market square. At the “Forum” the urban edge deviates from its role as a topographical feature to become a series of steps which are ideal for sitting on and are oriented towards a new circular fountain. Black concrete furniture in a variety of shapes with wooden seating surfaces invites passers-by to rest for a while in the foyer to the market square and in Kirchpark. 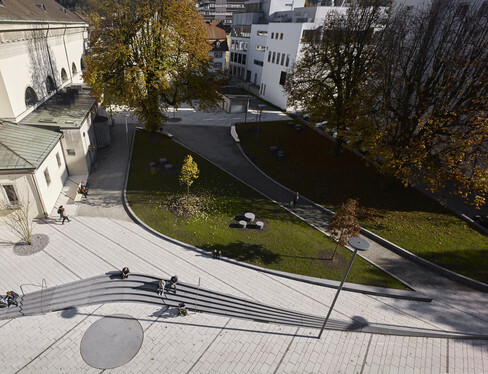 The materiality and pattern of the surface to the market square is carried over into the expansion where the contrast between colours becomes even stronger. As a result, the light-coloured granite and anthracite-coloured basalt further reinforce the self-explanatory alliance between the historical and new aspects of the town centre. 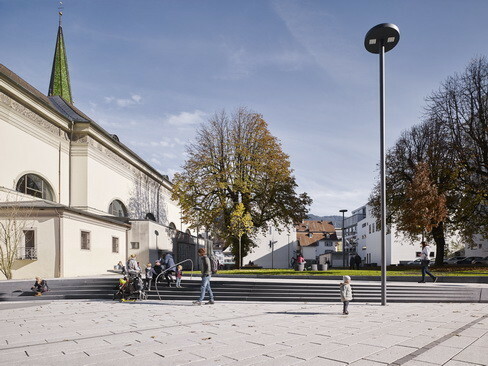 The overall project for the enhancement of central Dornbirn is being carried out in a series of construction phases. The completed first phase has been very well received by the public and, hence, is already doing justice to its promised role as a popular, lively central district.